How much does a third-party delivery cost? Well, it depends who you ask and how good their contract is. Of all the transparency and data that technology brings to the restaurant industry, what exactly the fees are for restaurants is pretty murky. Delivery fees fluctuate slightly by region and delivery distance, but generally they aligns with an NPD Group survey stating that $5 is the ideal cost for consumers. But when it comes to the percentage of each sale, things get tricky. Danny Schwartzman, the owner of Common Roots Café in Minneapolis and one of the initial area restaurateurs included in Amazon’s PrimeNow delivery program, said fees were the only thing contractually he couldn’t talk about. Schwartzman said he was able to negotiate when he was approached by Amazon because he was ambivalent about the deal. “I talked about what I was comfortable with,” he said. “If you’re going into it from the perspective of I don’t need to do this, that’s a pretty good negotiating position to start with,” Schwartzman said, adding that was his gut-feeling, not a negotiation tact. Darren Tristano, president of restaurant research and consulting firm Technomic, said that sentiment holds true across the industry. “The competitiveness of the market creates an opportunity for these brands to work harder to get business, and because there are so many local and national players, there are always going to be sales and account managers trying to win business, that’s going to give operators leverage,” Tristano said. “It’s important to talk to multiple groups to see who is best and do a test to see which costs are better and provide the sales. When exploring options with third-party delivery providers, the first call should be to friendly operators who will be willing to talk behind closed doors. Know who’s using the services and who has had success with them. For larger brands, negotiating is a little easier. The big public companies have the power to make choice deals in boardrooms as the third-party services scramble for market penetration and exclusive deals. While the details of a two-location test in the Buffalo Wild Wings system are off the record, one can bet they’re not paying 30 percent of the ticket on fees. Medium-size brands like 14-location Flying Biscuit Café have found success by negotiating as an entire brand. Brent Fuller, brand leader and VP of operations at the bakery concept said, they’re exploring various third-party delivery companies as a brand instead of location-by-location. “We’re going back and really formalizing partnerships with these services and doing what we can. With a franchise system, you’ll always have people that go out on a limb and sign up for something you don’t know about,” said Fuller. Going rogue, added, makes for mediocre deals and leaves the data provided by the services under-utilized. Since negotiating as a brand, he said, they’ve been able to stay mostly within their maximum 20 percent fee range. 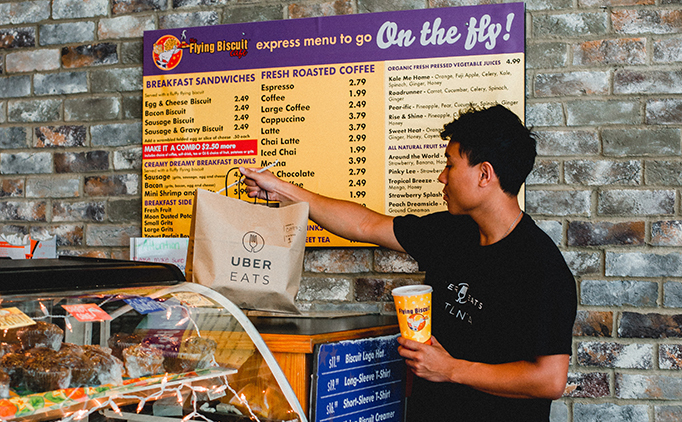 Of the brands he works with, he said, Grubhub “wouldn’t budge” on fees, nor would UberEats, citing the high cost of paying drivers. Postmates and Doordash, however, did bring down ticket percentage fees for the brand.